Emami Art, formerly known as Emami Chisel Art (ECA), part of the reputed Emami Group of Companies, is proud to return to India Art Fair in the Galleries section for the upcoming edition, due to take place from 9 – 12 February, 2018. The booth display at​ the fair has been conceptualised by Anupa Mehta, curatorial advisor to the gallery, along with Richa Agarwal, CEO Emami Art. It highlights their new curatorial approach which focuses on contemporary practitioners from the region and elsewhere in India. A selection of artists will be showcased, including Anwar Chitrakar, Chittrovanu Mazumdar, Jamini Roy, Jayashree Chakravarty and Jogen Chowdhury. Traditional and contemporary works will sit side by side exemplifying Emami Art’s renewed thrust towards promoting the best of Indian Modern and Contemporary art practice. It is a precursor to the gallery’s new programming approach, which will come into effect post the opening of it’s strikingly designed new art space in Kolkata, to be launched later in the year. 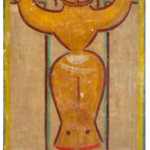 The inclusion of Jamini Roy’s Crucifixion is an important marker, representing traditional as well as painterly departures that have shaped modernist practices in the region. Displayed alongside a suite of delightful contemporary pat paintings by award winning master craftsman, Anwar Chitrakar, the work highlights the legacy and richness of traditional idioms from where contemporary practitioners continue to draw inspiration. In contrast, the works of Chittrovanu Mazumdar and Jayashree Chakravarty (recently did a solo show at Musée Guimet, Paris) display more eclectic international influences. Building from an abstract expressionist vocabulary, (although he prefers not to be slotted in any genre), Chittrovanu Mazumdar’s works are to be experienced rather than seen, given their affinity for cross disciplinary borrowings and the theatrical. He will be showing an enormous metal construct, a multimedia installation which combines technology and imagery to highlight the material qualities of its medium. 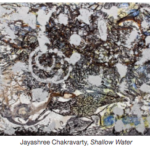 Jayashree Chakravarty, who lives and works between Kolkata and Paris, has acknowledged the influence of French impressionism and Byzantine mosaic design, among other ideas, on her work, She avers that her works are immensely personal and intimate. Yet her quest is to transform these experiences into universal, even metaphysical, truths via her paintings and drawings which verge on abstraction. The display at the Emami booth has been tightly curated, and offers a carefully considered attempt to present art from the region in a new light, drawing attention to the exceptional idioms of its most eminent contemporary practitioners. Born in Bankura, West Bengal, India, in 1887, Jamini Roy joined the Government College of Art & Craft, Kolkata in 1903. Roy adopted the simplification of the forms, the bold, flat colours and the medium, material and themes of local folk paintings. He discarded expensive canvas and oil paint and opted for the more inexpensive material and medium of the folk artist. He rendered images from Ramayana and Krishna Leela. He painted ordinary men and women from the village, reinventing popular images from the patua’s repertoire. Jamini Roy restricted his palette to seven colours- Indian reds, yellow ochre, cadmium green, vermillion, grey, blue and white. These were mostly earthy or mineral colours. His underlying quest was threefold: to capture the essence of simplicity embodied in the life of the folk people, to make art accessible to a wider section of people and to give Indian art its own identity. Some of his solo exhibitions were in New York in 1953; Burlington gallery, London in 1946; British Indian street, Kolkata in 1938; Samavaya mansions, Kolkata in 1937 and many more. His works can be found in several private and public collections, institutions and museums all over the world. In 1976, the Archaeological Society of India declared him one of ‘nine masters’ to be treated as treasure. In 1955, he was made the first fellow of the Lalit Kala Akademi, the highest honour in the Fine Arts conferred by the Lalit Kala Akademi, India’s National Academy of Art, Government of India. In 1954, he was awarded the Padma Bhushan by the Government of India. In 1934, he received Viceroy’s gold medal in an all India exhibition for one of his work. 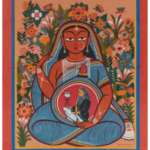 Jamini Roy passed away in 1972 in Kolkata. ​​Born in Faridpur, Bangladesh, 1939, Jogen Chowdhury graduated from the Government College of Art & Craft, Kolkata in 1960 and subsequently received scholarship from the French government and went on to study at the Beaux-Arts de Paris in 1967. Chowdhury developed his individual style after his return from France in the late ’60s. Although Chowdhury has painted oils, his forte is painting in ink, watercolour and pastel. He is predominantly popular for his line drawings with ink. The use of ink combined with pastels has been his forte, with which he explores the soft curves and angularities of contorted bodies. A technique that the artist generously used in his ink and pastel works is cross hatching. In fact, it has become the most recognizable feature of Chowdhury’s style. With cross hatching, he has developed the illusion of middle tonalities, creating volume by the use of modulating light and shade. Chowdhury has had numerous solo and group exhibitions, some of his noted exhibitions include ‘Jogen Chowdhury: Formative to Recent’, CIMA, Kolkata in 2014; ‘Lignes de Meditation’, Gallery Veda, Chennai in 2012-2013; ‘A Calligraphy of Touch and Gaze’, presented by Kalakriti Art Gallery at ICIA; Mumbai in 2008 and ‘Abahoman: Flowing Life’, Vadehra Art Gallery, New Delhi in 2007. Chowdhury has also had solo exhibitions at Gajah Gallery, Singapore, Gallerie Foundation for Indian Artists, Amsterdam and the Fine Art Resource, Berlin. His art works are part of important collections in India and abroad. Chowdhury was honourable jury member, Singapore biennale exhibition of art, Singapore in 2003, Kalidas Samman, Government of Madhya Pradesh in 2001. In 1986, received an award at the second biennale of Havana, Cuba. He was awarded the Prix le France de la Jeune Peinture, Paris in 1966. The artist resides and works in West Bengal. ​Born in Khoai, Tripura, India, 1956, Jayashree was educated at Santiniketan and graduated in Fine Arts from Visva Bharati University, Santiniketan in 1978 and obtained a post-graduate Diploma from The Maharaja Sayajirao University of Baroda in 1980. In her works, she uses superimposed forms, quite like the sketches that cave painters worked on before mapping them on the walls of caves. Her imagery, because of her fluid and transparent images, reflect the present mood of the world, which is fluid in itself. At a mere conventional and figurative level, her works reflect the unity of man with nature. Her works are layered and emotional with a hint of nostalgia. Some motifs constantly recur in her paintings like dogs, waves and serried crescent shapes. Influenced by post-modernist painters, each of her canvas seems to embrace the entire gamut of colors that range from blues to even purple. Chakravarty has exhibited across India and Sweden and her works can be seen in the NGMA, New Delhi and in Chandigarh Museum. In 2016 she had a solo show ‘Life will Never be the Same’ in association with Kiran Nadar Museum of Art at Musee Des Arts Asiatiques De Nice, France. Her major solo shows include ‘Where the Sand meets the Sky’, Bodhi Art, New York in 2007; ‘New Narratives: Contemporary Art from India’, Chicago in 2007; ‘Route Map of Experience’, India Habitat Centre, New Delhi in 2003; ‘The Mind is its Own Place’, New York in 2002. Chakravarty is probably the only Indian artist to show at the prestigious Drawing Centre in New York in 1998. Her works can be seen in the NGMA, New Delhi and in Chandigarh Museum. She won an award in 1988 in the II Bharat Bhavan Biennale Bhopal. She has also been honoured with the Bombay Art Society award, Mumbai in 1980, honourable mention award, Asian Art Biennial, Bangladesh in 1997 to name some. The artist lives and works out of Kolkata and Paris. ​Born in Paris, France, in 1956, Chittrovanu Mazumdar is a contemporary Indian artist of Bengali-Indian and French descent. He pursued Bachelors in Fine Arts from Government College of Art and Craft, Kolkata in 1981 and studied painting and printmaking from Beaux-Arts de Paris in 1983. Having grown-up in an open and supportive family setting, he never had to restrain his artistic impulses as many artists do. Chittrovanu’s work pulls from various influences, be it visual, musical or lyrical. His paintings are sometimes created on very large canvases and the visual elements are often constructed in layers, creating the effect of being visible and shrouded at the same time. His installations employ a wide range of technologies and materials and he has been using material other than paint on the canvas. Chittrovanu’s raw, almost expressionistic, canvases create a powerful emotional response. Some of his well-known exhibitions are, MANA Contemporary, New Jersey in 2016; ‘….and undated night skin’, The Harrington Street Arts Centre, Kolkata presented by 1 x 1 Art Gallery, Dubai in 2012; ‘Various’, Royal Academy of Arts, London presented by Gallerie 88, Kolkata in 2006; ‘Recent Works’, presented by Seagull Foundation for the Arts, Kolkata at Jehangir Art Gallery, Mumbai and Sumukha Art Gallery, Bangalore in 1997. Chittrovanu has been part of several prominent art fairs namely, Gwanju Art Fair in association with Latitude 28, New Delhi 2011: India Art Summit, 1×1 Art Gallery, New Delhi in 2012; India Art Fair, New Delhi presented by 1×1 Art Gallery, Dubai in 2012; ‘The Intuitive: Logic Revisited’, from the Osians Collection at The World Economic Forum, Davos, Switzerland in 2011; ‘Art Stage Singapore’, Singapore presented by 1×1 Gallery, Dubai in 2011 and many more. Chittrovanu Mazumdar is an internationally celebrated artist and his art is part of various important and well known collections in India and abroad. The artist resides and works in Kolkata. ​Born in Midnapore, West Bengal, India, in 1980, Anwar Chitrakar has been practicing Kalighat art for over 20 years. Originally working as tailor, Anwar now strives to revive the lost glory of Kalighat patas through his work, combining traditional techniques with contemporary subjects and sensibilities.Anwar began as a traditional patua artist in the 19th century Kalighat style, depicting baboos and their bibis, and then gradually progressed as a more individualistic painter. Today, most of his work ties on mythological themes. He began as a traditional patua artist in the 19th century Kalighat style, depicting baboos and their bibis, and then gradually progressed as a more individualistic painter. Today, most of his work ties on mythological themes. Two things stand out in his work, firstly, even though he calls himself a patua, and the iconography in his work draws distinctly from the patachitra universe, he borrows from other traditions like Mithila painting in order to, perhaps, underline his difference from other artists, and imbue his work with layers of meaning. Another aspect which stands out in his work is his signature, since the designs and songs in patachitra are communally owned, an artist signing his/ her work is very rare. Anwar has participated in many group exhibitions, namely, Berlin Festival, Berlin, Germany in 2012; Namaste India Festival, Japan in 2012 and more. His work on Kalighat patachitra paintings has been showcased at Kolkata’s Victoria Memorial and London’s Victoria and Albert Museum. His works have been collected by many art collectors in India and in countries like Germany, UK, France and USA. He has been recipient of few prestigious awards, President’s award in 2006; State award by Government of West Bengal in 2002; the Rabindra Bharati University award for innovations in patua painting. The artist resides and works in his hometown.